Pregnant Hilary Duff isn't shy to showcase her growing baby bump! 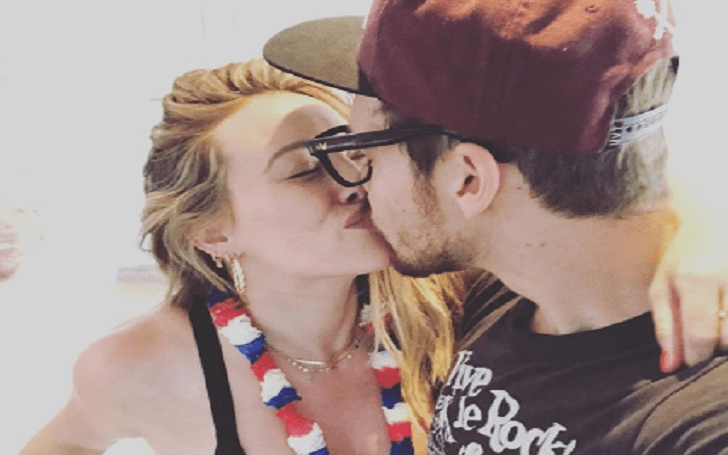 The Disney Channel star took to Instagram on Thursday, July 5 to share a selfie of herself and boyfriend Matthew Koma sharing a passionate kiss in Malibu, California. The 30-year-old Younger star sported a black bikini for the love-infused photo and she finished off the look with a red, blue and white lei around her neck. Here's the romantic snap, check it out. Additionally, on Friday, July 6, Hilary was also photographed heading back to her car after attending a yoga class. At the moment, her baby bump was clearly visible as she wore a form-fitting white tank, dusty rose-hued leggings and a Ralph Lauren cap. As previously reported, the Material Girls star announced her pregnancy with second child last month pregnant. Hilary shared a beautiful Instagram photo to announce that the couple was expecting together as the actress wore a long maxi dress, showing off her growing baby bump. This will be the first baby for Matthew while for Hilary, it will be the second. She already shares a son Luca, 6, with her ex-husband Mike Comrie, with whom she was married from 2010 to 2016. Hilary's pregnancy news had come just three days after her sister Haylie Duff gave birth to a daughter named Lulu. Selena Gomez Is Upset Over The Weeknd Unfollowed Her On Instagram: Still Loves Ex-Boyfriend?